Over the course of seven days staying in the Ocean Beach community in San Diego, California I went to visit the Ocean Beach Pier several times. It looked and felt different each time. I was there for a brilliant sunset. I was there as a storm approached. I was there when the pier was nearly completely empty, and when it was filled with people. I met a pelican. I walked it, and I rode a Bird (electric scooter) down it. I listened to the stories the ocean whispered as it passed under and around the pier. I traveled down to Belen, New Mexico with my photography gear and Kiki for a rural land photography shoot. I have been to this exact area of Belen twice before, and know it so well I knew where to look for a cow skeleton, which was still there even though I have not been to this area for over a year! I got my daylight shots, then had time to walk around with Kiki in total silence save for the blowing wind. Then we settled in a spot and I setup my Nikon D750 on my Indoor carbon fiber tripod and waited for the sun to get into position. I decided to make the shot just as the sun peaked below the cloud cover while still above the distant mountain. Since the land itself was just desolate, I composed to show more of the spectacular clouds. I got paid to enjoy this view. Sometimes, being a photographer is not too bad, sometimes. The Japanese have a custom of watching the first sunrise of the year. My first year living in Japan friends took me to a Buddhist temple at midnight on New Year's Eve and then to a beach at sunrise. I really like this custom. So this morning shortly after 7am I took my camera and tripod out onto the frosty ground and watched the sunrise over an Iowa cornfield. You can see five jets already streaking to far off destinations so early in the new year! I have not made many photographs of Cape Coral in my time here for a variety of reasons. This photo of the Caloosahatchee River at twilight is the start of a series of Cape Coral fine art photographs I will be making available for commercial license usage (on websites, in local marketing materials, etc) and also as fine art prints. These fireworks were not the first flashes of light in the skies over Cape Coral on 4th of July 2016 evening. Those were from the lightning sparking horizontally through the clouds. Still, Red White & Boom 2016 started sharply at 9:30pm with only a very light sprinkle. Toward the end the rain did start coming down a little harder and you can see the water droplets that got on my camera lens in the lower right corners of the two photos below. 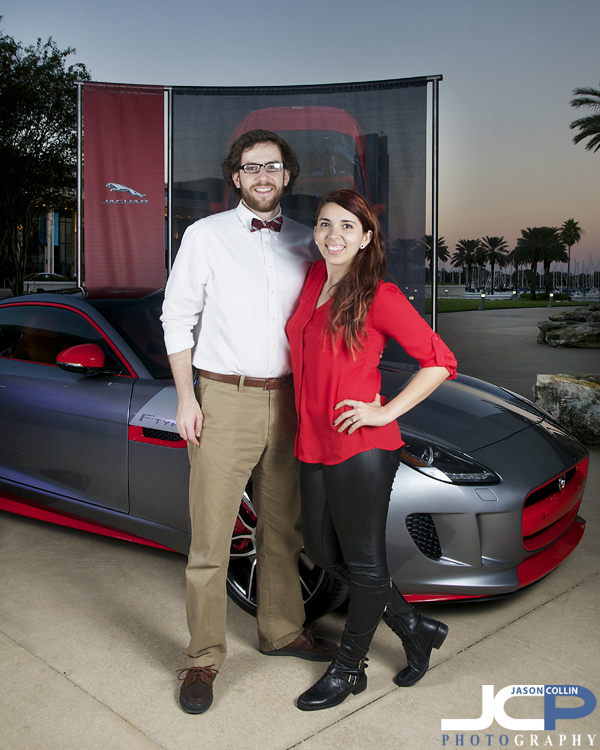 The Dali Museum in St. Petersburg was host to an event put on by Crown Jaguar for guests to come and see some of its cars, including the stunning new Jaguar F-Type Coupe (see above). This was my second time working for Crown, as I photographed the Audi A3 premiere event back in April too. 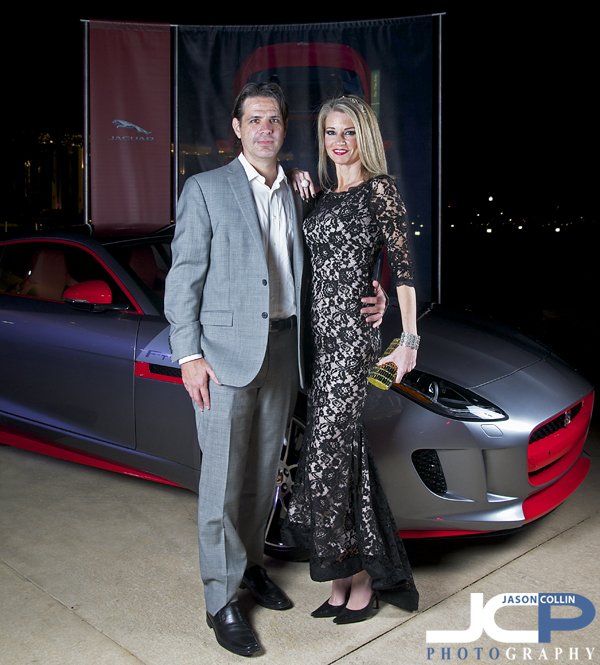 This time they hired me to photograph all the guests as they arrived in front of a F-Type. This was my first time doing this kind of arrival portrait photography actually. The shooting began just before sunset so early arriving guests got a colorful background like in the above portrait. Soon night came and the background became just a few distant lights. This was my setup for all the portraits. My camera was on a tripod so every shot was in the same framing. I advised people to stand in front of the front wheel of the Jaguar F-Type Coupe to further insure similar photo results. I had two speedlights each in a brolly and kept the one to frame left constant, but as night fell moved the one to frame right to also light the car more. Unfortunately, the provided lighting for the car was not very bright at all. I compensated for that by moving one speedlight and tweaking a few camera settings. I ended up pleased with the results of night portraits using just two speedlights with a large background object (the car). Some guests wore costumes as Halloween was just three days away. It was interesting to look up and see who might appear before my lense each shot. Many people joked asking if this photo was their opportunity to win the car or something like that. I only ever replied simply, "umm, no." The Jaguar F-Type Coupe received universal praise for its looks by everyone. 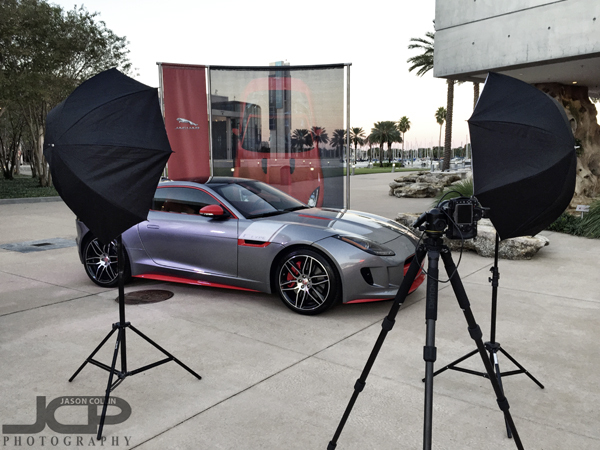 As of the time of shooting, Crown Jaguar did have this particular F-Type for sale! It was a fun and challenging evening of photography, my favorite kind, and I got to stare at a beautiful car the whole time too. 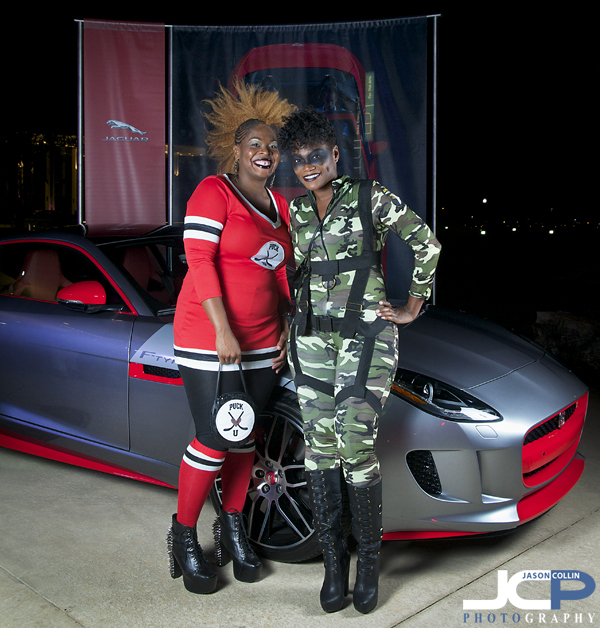 Two Crown Jaguar employees helped make sure each guest would receive their print of the photos I made by writing down the photo number as I shot, thank you ladies! Reserve Event Photography for your business today! 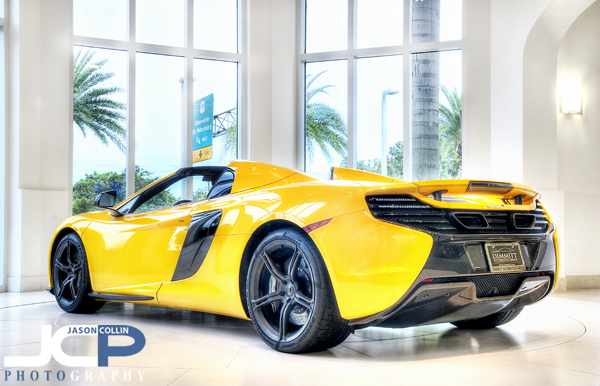 Yellow McLaren 650S Spider at Dimmit Automotive Florida Car Photography - Nikon D300 Tamron 17-50mm @ f/11 ISO 200 7-exposure HDR tripod mounted with cable releaseFeatured prominently in the front window of the Dimmitt Automotive showroom in Pinellas Park Florida, this yellow McLaren 650S Spider certainly is an eye catcher. 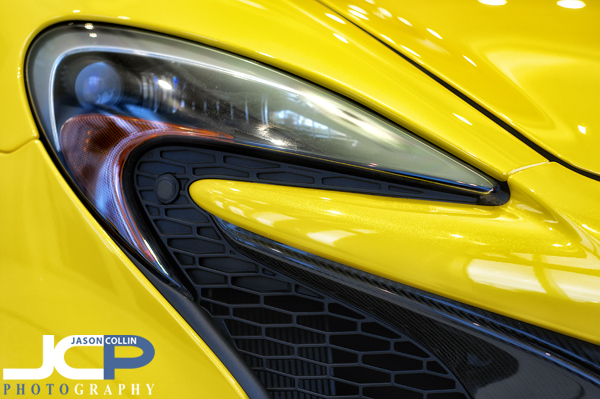 The contrast of the bright yellow paint and black trim on the newly stylized supercar from McLaren looks striking. I was barely able to squeeze in between the car and the window with my Nikon and tripod to be able to make the above shot. 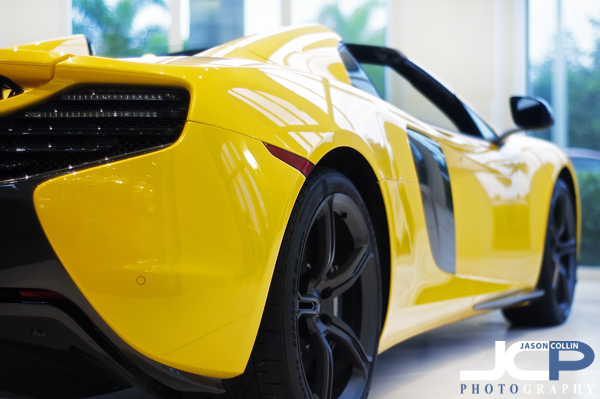 Carbon fiber trim on a yellow McLaren 650S Spider Florida Car Photographer - Nikon D300 Nikkor 50mm @ f/2.8 ISO 200 1/15th tripod mounted with cable releaseThere was plenty of carbon fiber trim on the body of the McLaren 650S Spider, including all along the rocker panel as seen in the above image. 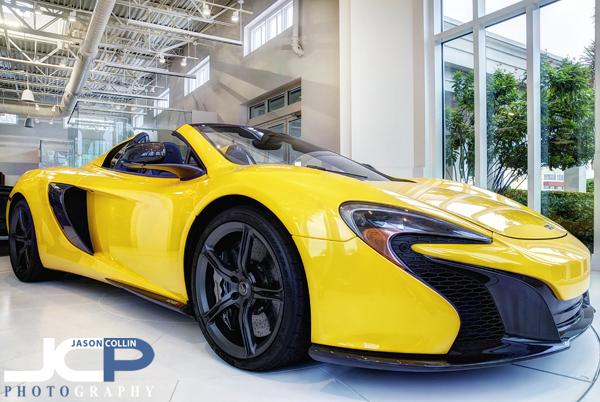 Yellow McLaren 650S Spider for sale at Dimmitt Automotive Florida Car Photography - Nikon D300 Tamron 17-50mm @ f/11 ISO 200 7-exposure HDR tripod mounted with cable releaseFollow that green exit sign in the window to swing into Dimmitt and part ways with a not unsubstantial amount of cash and you can leave in this yellow McLaren 650S Spider. I think the color and spider body style work well with the Florida gulf coast lifestyle, well, at least once the sun goes down a little bit. The 650S follows the McLaren 12C which some said was a little boring for an exotic car (I didn't think so). 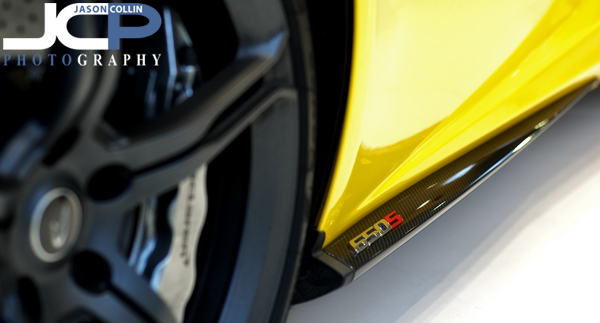 The 650S borrows design elements, like the above McLaren logo shaped headlights, from the P1 hypercar giving it more than enough flash for a midengined supercar to look the part. It is always nice to spend time photographing a supercar. I imagine it as far, far nicer to actually drive one!